Although breastfeeding is the main nutrition source of infants, it could also be a source of exposure to toxic metals. The present study aimed to evaluate the levels of lead (Pb) and cadmium (Cd) in breast milk, investigate the effects of some sociodemographic parameters on these concentrations, and assess the correlations between these metals and infant growth. Breast milk samples (20-30 ml) were obtained from 100 women in the second month postpartum. Pb and Cd levels were determined using inductively coupled plasma mass spectroscopy (ICP-MS). Mean concentration of Pb in the samples was 6.8 µg/l, and the concentration of Cd in the collected breast milk was lower than the limit of detection (0.1 µg/l). In 74% of the samples, Pb level was higher than the recommended limit by the World Health Organization (2-5 µg/l). In addition, mean weekly intake of Pb (6.65 µg/kg/week) and Cd (0.098 µg/kg/week) was lower than the tolerable weekly intake for infants. No correlations were observed between the Pb concentration in breast milk and the weight, length, and head circumference of infants at birth and after two months. According to the results, exposure to Pb exceeded the standard limit in the infants in the present study. Therefore, it is recommended that breast milk monitoring programs be conducted on larger sample sizes longitudinally. 1. Chao H-H, Guo C-H, Huang C-B, Chen P-C, Li H-C, Hsiung D-Y, et al. Arsenic, cadmium, lead, and aluminium concentrations in human milk at early stages of lactation. Pediatr Neonatol 2014; 55(2): 127-34. 2. Wong SL, Lye EJ. Lead, mercury and cadmium levels in Canadians. Health Rep 2008; 19(4): 31-6. 3. Organization WH, Unicef. Global strategy for infant and young child feeding: World Health Organization; 2003. 4. Winiarska-Mieczan A. Cadmium, lead, copper and zinc in breast milk in Poland. Biol Trace Elem Res 2014; 157(1): 36-44. 5. Vieira SM, De Almeida R, Holanda IB, Mussy MH, Galvão RC, Crispim PT, et al. Total and methyl-mercury in hair and milk of mothers living in the city of Porto Velho and in villages along the Rio Madeira, Amazon, Brazil. Int J Hyg Environ Health 2013; 216(6): 682-9. 6. Victora CG, Bahl R, Barros AJ, França GV, Horton S, Krasevec J, et al. Breastfeeding in the 21st century: epidemiology, mechanisms, and lifelong effect. Lancet 2016; 387(10017): 475-90. 7. Leotsinidis M, Alexopoulos A, Kostopoulou-Farri E. Toxic and essential trace elements in human milk from Greek lactating women: association with dietary habits and other factors. Chemosphere 2005; 61(2): 238-47. 8. Chien L-C, Han B-C, Hsu C-S, Jiang C-B, You H-J, Shieh M-J, et al. Analysis of the health risk of exposure to breast milk mercury in infants in Taiwan. Chemosphere 2006; 64(1): 79-85. 9. Tripathi R, Raghunath R, Sastry V, Krishnamoorthy T. Daily intake of heavy metals by infants through milk and milk products. Sci Total Environ 1999; 227(2-3): 229-35. 10. Zazouli MA, Bandpei AM, Maleki A, Saberian M, Izanloo H. Determination of cadmium and lead contents in black tea and tea liquor from Iran. Asian J Chem 2010; 22(2): 1387-93. 11. Brender JD, Suarez L, Felkner M, Gilani Z, Stinchcomb D, Moody K, et al. Maternal exposure to arsenic, cadmium, lead, and mercury and neural tube defects in offspring. Environ Res 2006; 101(1): 132-9. 12. Dorea JG. Mercury and lead during breast-feeding. Br J Nutr 2004; 92(1): 21-40. 13. Hassett-Sipple B, Swartout J, Schoeny R. Mercury study report to Congress. Volume 5. Health effects of mercury and mercury compounds. Environmental Protection Agency, Research Triangle Park, NC (United States). Office of Air Quality Planning and Standards, 1997. 14. Ettinger AS, Téllez-Rojo MM, Amarasiriwardena C, Peterson KE, Schwartz J, Aro A, et al. Influence of maternal bone lead burden and calcium intake on levels of lead in breast milk over the course of lactation. Am J Epidemiol 2005; 163(1): 48-56. 15. Schnaas L, Rothenberg SJ, Flores M-F, Martinez S, Hernandez C, Osorio E, et al. Reduced intellectual development in children with prenatal lead exposure. Environ Health perspect 2006; 114(5): 791-7. 16. Wang X, Yang Y, Wang X, Xu S. The effect of occupational exposure to metals on the nervous system function in welders. J Occup Health 2006; 48(2): 100-6. 17. Orun E, Yalçın SS, Aykut O, Orhan G, Morgil GK, Yurdakok K, et al. Breast milk lead and cadmium levels from suburban areas of Ankara. Sci Total Environ 2011; 409(13): 2467-72. 18. Ballew C, Khan LK, Kaufmann R, Mokdad A, Miller DT, Gunter EW. Blood lead concentration and children’s anthropometric dimensions in the Third National Health and Nutrition Examination Survey (NHANES III), 1988-1994. J Pediatr 1999; 134(5): 623-30. 19. Sinha M, Manna P, Sil PC. Cadmium‐induced neurological disorders: prophylactic role of taurine. J App Toxicol 2008; 28(8): 974-86. 20. Mates JM, Segura JA, Alonso FJ, Marquez J. Roles of dioxins and heavy metals in cancer and neurological diseases using ROS-mediated mechanisms. Free Radic Biol Med 2010; 49(9): 1328-41. 21. Kosanovic M, Jokanovic M, Jevremovic M, Dobric S, Bokonjic D. Maternal and fetal cadmium and selenium status in normotensive and hypertensive pregnancy. Biol Trace Elem Res 2002; 89(2): 97-103. 22. Vahter M, Berglund M, Akesson A, Liden C. Metals and women's health. Environ Res 2002; 88(3): 145-55. 23. Gundacker C, Pietschnig B, Wittmann KJ, Lischka A, Salzer H, Hohenauer L, et al. Lead and mercury in breast milk. Pediatr 2002; 110(5): 873-8. 24. Rahimi E, Hashemi M, Baghbadorani ZT. Determination of cadmium and lead in human milk. Int J Environ Sci Technol 2009; 6(4): 671-6. 25. Goudarzi M, Parsaei P, Nayebpour F, Rahimi E. Determination of mercury, cadmium and lead in human milk in Iran. Toxicol Ind Health 2013; 29(9): 820-3. 26. Bose-O’reilly S, Lettmeier B, Roider G, Siebert U, Drasch G. Mercury in breast milk–A health hazard for infants in gold mining areas? Int J Hyg Environ Health 2008; 211(5-6): 615-23. 27. World Health Organization. Minor and trace elements in breast milk: report of a joint WH. 1989. 28. Onis M. WHO Child Growth Standards based on length/height, weight and age. Acta paediatrica 2006; 95(S450): 76-85. 29. 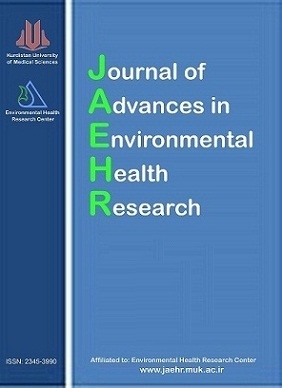 Vahidinia A, Samiee F, Faradmal J, Rahmani A, Taravati Javad M, Leili M. Mercury, Lead, Cadmium, and Barium Levels in Human Breast Milk and Factors Affecting Their Concentrations in Hamadan, Iran. Biol Trace Elem Res 2018: 1-9. 30. Behrooz RD, Esmaili-Sari A, Peer FE, Amini M. Mercury concentration in the breast milk of Iranian women. Biol Trace Elem Res 2012; 147(1-3): 36-43. 31. Cinar N, Ozdemir S, Yucel O, Ucar F. In which regions is breast-feeding safer from the impact of toxic elements from the environment? Bosnian journal of basic medical sciences 2011; 11(4): 234-9. 32. Del Ciampo LA. Determination of lead concentration in breast milk and blood of lactanting women in an interior city of Brasil. Int J Nutr 2013; 6(3): 95-100. 33. Abdollahi A, Tadayon F, Amirkavei M, editors. Evaluation and determination of heavy metals (mercury, lead and cadmium) in human breast milk. E3S Web of Conferences; 2013: EDP Sciences. 34. Nazarpour S, Teimoori L, Teimoori S. Cadmium and Chrome Concentrations in Human Milk. Knowledge Health 2014; 9(1): 21-9. 35. Bentum J, Sackitey O, Tuffuor J, Essumang D, Koranteng-Addo E, Owusu-Ansah E. Lead, cadmium and arsenic in breast milk of lactating mothers in Odumanse-Atua community in Manya Krobo district of eastern region of Ghana. J Chem Pharm Res 2010; 2(5): 16-20. 36. Garcia-Esquinas E, Perez-Gomez B, Fernandez MA, Perez-Meixeira AM, Gil E, De Paz C, et al. Mercury, lead and cadmium in human milk in relation to diet, lifestyle habits and sociodemographic variables in Madrid (Spain). Chemosphere 2011; 85(2): 268-76. 37. Koyashiki GaK, Paoliello MMB, Matsuo T, De Oliveira MMB, Mezzaroba L, De Fátima Carvalho M, et al. Lead levels in milk and blood from donors to the Breast Milk Bank in Southern Brazil. Environ Res 2010; 110(3): 265-71. 38. Bradman A, Eskenazi B, Sutton P, Athanasoulis M, Goldman LR. Iron deficiency associated with higher blood lead in children living in contaminated environments. Environ Health Perspect 2001; 109(10): 1079-84. 39. Wright RO, Tsaih S-W, Schwartz J, Wright RJ, Hu H. Association between iron deficiency and blood lead level in a longitudinal analysis of children followed in an urban primary care clinic. J pediatr 2003; 142(1): 9-14. 40. Hallen IP, Jorhem L, Lagerkvist BJ, Oskarsson A. Lead and cadmium levels in human milk and blood. Sci Total Environ 1995; 166(1-3): 149-55. 41. World Health Organization, Additives WECOF. Evaluation of certain food additives and contaminants: seventy-third [73rd] report of the Joint FAO/WHO Expert Committee on Food Additives. 2011. 42. Kordas K, Lopez P, Rosado JL, García Vargas G, Alatorre Rico J, Ronquillo D, et al. Blood lead, anemia, and short stature are independently associated with cognitive performance in Mexican school children. J Nutr 2004; 134(2): 363-71. 43. Gundacker C, Pietschnig B, Wittmann KJ, Salzer H, Stöger H, Reimann-Dorninger G, et al. Smoking, cereal consumption, and supplementation affect cadmium content in breast milk. J Expos Sci Environ Epidemiol 2007; 17(1): 39-46.